In fact, I still have some, stashed away in the loft at my parents house. Mum,Dad - Can I Have Another 10p Pleeeaaaase. I had completely forgotten about them, but yeah I used to absolutely love them. Looking back I'm not sure why. I might still get a couple for old times sake. 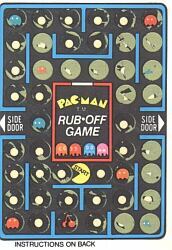 I used to have a rub off game I played when I was a youngster as well. felgekarp wrote: I used to have a rub off game I played when I was a youngster as well. you just had to, didn't you? I remember having those as a child too! Sheesh, how easily pleased were we back then?